WESTPORT -- Jack Massie has all the luxuries a quarterback could ask for. A three-year starter at Staples, Massie has a game-breaking receiver to throw to, an electric ground game to keep defenses honest, and perhaps most importantly, a bruising offensive line that keeps him upright on nearly every drop back. Staples is the state's highest-scoring offense, racking up 52 points a game, and Massie credits the Wreckers' unheralded front five of Nick Ward, Burim Trdevaj, Chris Speer, Will Patrick and Kyle Vaughn for fueling the explosive read-option attack. "They're all big guys. They protect me well. They keep me from getting bumps and bruises," Massie said on Monday as the team prepared to make its second straight appearance in the FCIAC championship game, at Greenwich on Thanksgiving. The physically imposing line--with all five starters weighing over 250 pounds--has been close to impenetrable this season. Massie has been one of its biggest beneficiaries. Through eight games, he's been sacked just four times, two of which were coverage sacks. Mistakes by the line are so rare that when they do happen, an eyebrow, or two, is raised. "We take a lot of pride in keeping Jack Massie upright. That's one of the most important things--that and being tough," said Vaughn, the 6-foot-4, 280-pound right tackle. "We know that if you give Massie time, he's a good enough quarterback to find the right man." Massie has made a living with all the time his line's afforded him in the pocket this season, and is engineering an offense that's averaging 498 yards per game, good for second in the state. In eight wins, the Wreckers have scored no fewer than 49 points--the type of gaudy statistic that would not be possible without a reliable line. "As they go, is how this team goes," head coach Marce Petroccio said. Irreplaceable it might be, the line has built a level of cohesion that's cherished at Staples. Four of the five starters played on last year's FCIAC championship team, while the 5-foot-10, 250-pound Trdevaj slid in at left guard at the start of this season to fill the vacancy left by Jack Gibson. The Wreckers' line has become inseparable, having started every game together this season. Four of the linemen are seniors, while Ward is the lone junior. "We're all best friends. We're hanging out all the time at practice and during meetings we're always communicating," Vaughn said. "We're really comfortable with each other." "We know each other well, so we know what we're going to do (on the field)," added the 6-foot-4, 290-pound Ward, who protects his quarterback's blind side at left tackle. "It's just a great thing to have." Massie, who has accounted for over 1,500 yards of offense (1,043 passing and 491 rushing), acknowledged that that communication is vital when running the read-option, which is dependent on rhythm and timing. The Wreckers' rushing attack has flourished with the guidance of the line, and is ranked fifth in the state. Four players have rushed for over 450 yards, led by senior Joey Zelkowitz (51 carries, 636 yards, 11 total touchdowns). The passing game has been just as explosive at times, as wide receiver James Frusciante has recorded 31 catches for 552 yards and eight touchdowns. "Our center Speer, his snaps pretty much have to be pinpoint every time so the timing is never off," Massie said. "He's done that. We haven't dropped a snap once." The line has been close to flawless in its technique and execution in all areas of the game, and has delivered the type of disciplined football that Petroccio envisioned. "My expectations were very high of them," he said. "My expectations deal more with their technique, their line calls, with their splits, with their steps. It's not so much about the game itself. It's about, are they staying on their blocks--all the little things that make them the great unit that they are." Petroccio, who has led teams to four FCIAC championships and three state titles in his 20 years at Staples, isn't hesitant to rank this year's line among the best he's coached. He's praised his linemen in all aspects, from their textbook knowledge of their assignments to their selfless team-oriented approach. 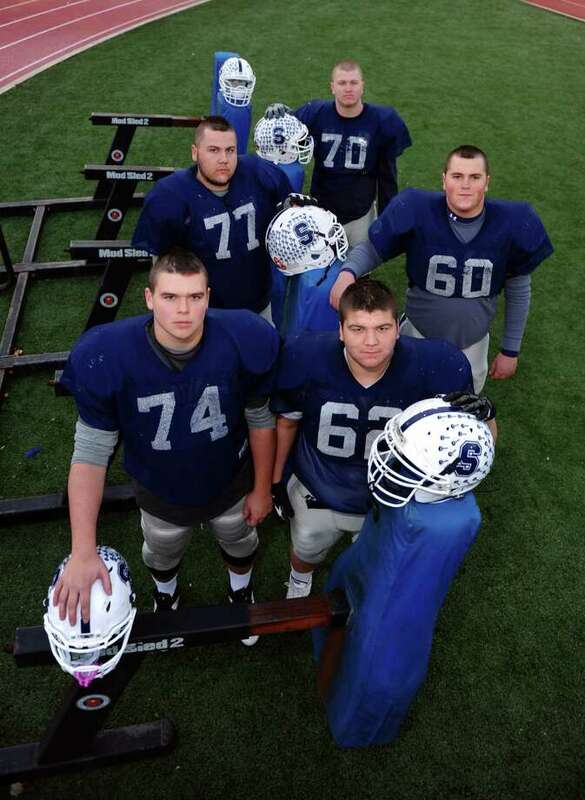 "This is one of, if not the best offensive line I've ever coached as a unit," Petroccio said. "We've had great players on the offensive line, but cohesively as a group, I don't think I've coached any better." Opponents have also heaped praise on Staples' offensive line. Danbury head coach Dan Donovan, whose team surrendered over 400 yards in a 51-6 loss to the Wreckers on Oct. 12, ranked the front five at the top of his list. "I don't think you're going to find an offensive line better than Staples'," Donovan said on Monday. Rather unselfishly, the linemen have little interest in collecting any personal accolades. Vaughn, who will play next year at Fordham Unviversity, explained that the line is more focused on keeping the Wreckers' offense ahead of everyone else. "We don't get a lot of glory as the offensive linemen, but we don't really care," he said. "As long as we're scoring points, winning games--we're 8-0--we couldn't ask for anything more." Petroccio wouldn't have it any other way either. "To have kids that are so selfless and not concerned about what's best for them," Petroccio said, "and more concerned about what's best for this team, it's refreshing. ... They are such a great group of kids and they are so tight-knit."